The following is a guest about earning extra money. If interested in submitting a guest post please read my guest post policy and then contact me. 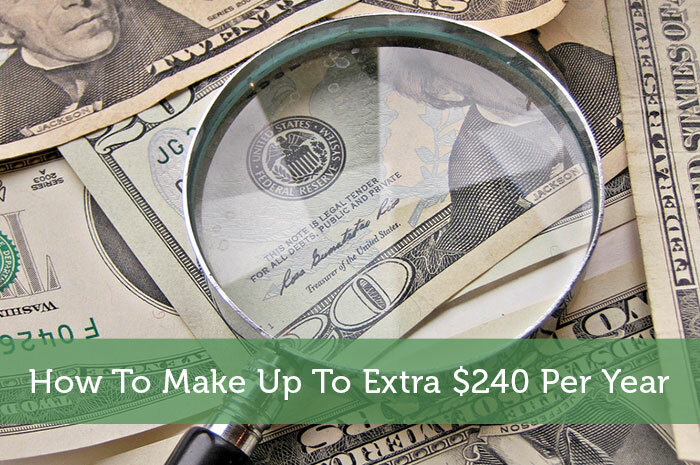 Chances are if you have a rewards credit card you have a hidden way of making up to an extra $240 per year. The exact amount you’ll make will depend on the type of rewards earning credit card you have. We recommend the American Express Fidelity card which earns a flat 2% cash back on all purchases, we will be using this card to illustrate this money making method but use whatever you feel most comfortable with. As always, we suggest setting your cash advance limit to $0 to avoid any possible cash advance fees. We haven’t heard of anybody being charged cash advance fees as long as you select “Goods/Services” and not “Cash Advance” in the Amazon Payments option screen. Amazon payments is Amazon’s competitor to Paypal, it allows consumers to send money to each other. You can also fund your Amazon Payment account with a rewards earning credit card and it’s treated as a purchase by all major credit card issuers (meaning you don’t have to pay any cash advance fees). As long as you have a personal account and send less than $1,000 per calendar month you will not be charged any fees. Simply go to: payments.amazon.com/ and then click “create account”. You’ll be prompted to sign in with your existing amazon account. when signing up make sure you’re signing up as an individual and not a business. Business accounts are charged a 2.9% fee and $0.3 per transaction. You’ll need to verify your e-mail address before you can do anything, then you’ll need to verify your bank account information. If you don’t add a bank account to your Amazon Payments account you will be limited to sending only $500 per calendar month. When you log in simply click “Add Bank Account” which will be in the right sidebar (pictured below). Amazon will then send you two small test deposits to that account, they’ll then ask you to enter how much those small test deposits were to verify your the account owner. Once you’ve verified your bank account, click “Add Funds” to fund your account. You’ll then need to enter your credit card information and the amount you want to fund. You can then send money to somebody you trust, to do so click “send money” and then enter the e-mail address associated with their Amazon Payments account. Ensure they have an account before sending any money. You’ll need to select the rewards earning credit card you want to use in the funding source section. Under the amount field you’ll see two check boxes, one will state “Goods/Services” the other will state “Cash Advance”. Make sure you click Goods/Services to avoid cash advance fees (you should’ve already set your cash advance limits to $0). Once you’ve sent them the money, get them to withdraw it to their linked bank account and give it back to you. They could give it back to you in cash, or they could write you a check. It’s extremely important to only do this with somebody you trust completely otherwise you could be out $1,000! Once you’ve received the money from your trusted friend or family member make sure you remember to pay off your credit card bill. If you forget then the high APRs will not only eat up any profits you make but you’ll also end up loosing money on the whole affair. If you follow the above steps you’ll be able to fund your Amazon Payments account with $12,000 per year, if you have a cash back earning credit card at 2% then this will earn you an additional $240 per year. We suggest trying to use it for it’s intended purpose and not just racking up credit card spend. For example, I use it to send small amounts to my girlfriend when she pays for joint activities. I also use it to pay for my gardener and cleaner and send my Mom a bit of extra money each month. If you have any questions about Amazon Payments or using this method, feel free to ask in the comments section below. There is also a massive 271 page thread on FlyerTalk where your question might’ve already been answered. This guest post was submitted by William who is the main contributor at doctorofcredit.com where he regularly blogs about consumer credit topics. He’s most in depth posts are on credit scoring models such as the most widely used credit score; FICO score. Thanks for the tip. I’m glad to know that there is a viable alternative to PayPal. I’m going to look into them right away. I buy lots of things on Amazon but didn’t know about this Amazon payment until now. Thanks for sharing this clever way to earn some extra money. I’ve had a bad experience with Amazon Payments. I’ve been trying all week to verify my bank account. Their fax number isn’t working, they’re sending me generic responses to my emails that are in no way helpful to me. I have used Amazon Payments to get some extra rewards and it still works. This can help you get to your rewards bonus spending limit as well.